2-8-0 1272 at Afton, Oklahoma on October 19, 1947 (Arthur B. Johnson). Four Frisco units at Oklahoma City, Oklahoma (date unknown). The train is on the Chickasha Subdivision at bridge 541.6 over the North Canadian River. This is the Frisco’s second crossing of the river in the city. The bridge is southwest of the downtown central core. It is west of the Oklahoma City Union Depot, MP 540.1. 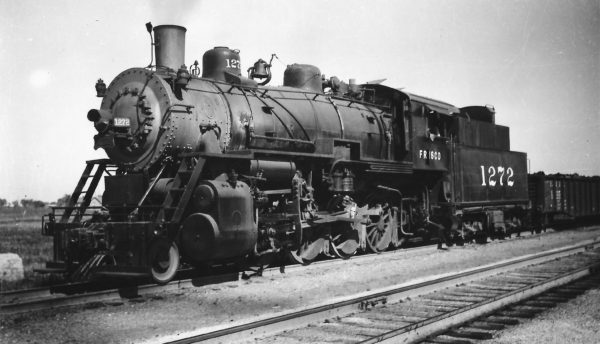 The Union Depot was jointly operated by the Frisco Railway and Rock Island Railroad. The depot address is 300 Southwest 7th Street. The railroad bridge is sandwiched between the river crossings of Exchange Avenue, upstream to the northwest (left), and South Western Avenue, downstream to the southeast (right). 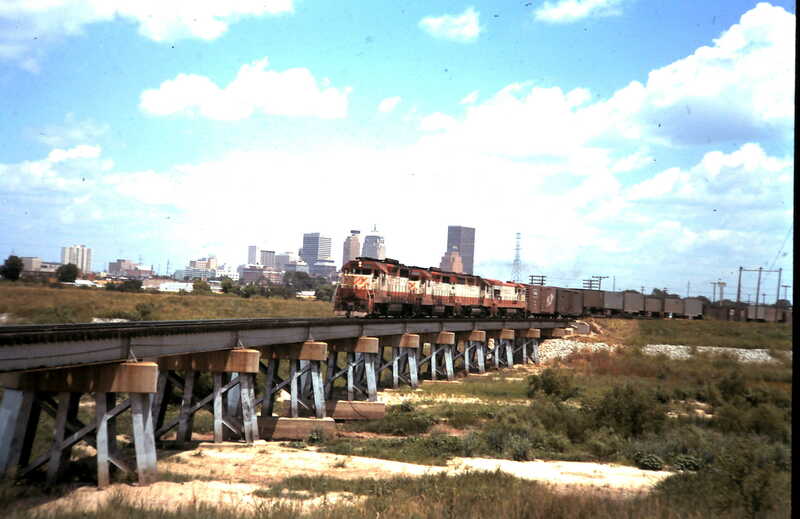 In 2005 the Frisco’s line past the depot and over this bridge was abandoned. This abandonment included the segment between the Santa Fe Railroad mainline overpass, MP 539.46, to the east and A.T.S.F. Crossing, MP 542.91, to the west. Traffic was rerouted over the former Fanta Fe line between these points. This was done to make room for the new route for Interstate 40, the Crosstown Expressway, south of downtown. Visible in the city center are a number of prominent landmark buildings. On the right standing tall over the third unit is the 36 story Liberty Tower. Now named Cotter Ranch Tower, it is also known as Chase Tower. It was completed in 1971. At the time of its construction it was the tallest building in the city at 500 feet. Now ranked as the second, the 50 floor Devon Energy Center completed in 2012 is now the tallest building in the city. Above the lead unit on the right with a tall rooftop spire topping out at 493 feet is the 1931 built, 33 floor, First National Bank Building/First National Center. It is located at 120 North Robinson Avenue. To its north (left in image) at 200 Park Place is the Art Deco style, 33 story, 1931 built, Ramsey Tower. It has been renamed the City Place Tower. At the time these were the second and third, today the third and fourth, tallest buildings in the city. The tall building just to the left of the train is Kerr-McGee Tower at 123 Robert South Kerr Avenue. It too was constructed in 1971 and is 30 stories tall. The building was renamed in 2008 for its new owner SandRidge Center. On the far left the 22 story tall white building is The Regency apartment complex completed in 1966 at 333 Northwest 5th Street. In 1977, one block to the east, on the south side of 5th Street will be built the Alfred P. Murrah Federal Building. It will be the target of a domestic terrorist attack on April 19, 1995. The known build dates of the large buildings, combined with the high horsepower locomotives and priority TOFC traffic help establish the time window to a narrow two year period. Post 1971 is established by the noted buildings. Priority trains QLA, QSF (westbound) and CTB (eastbound) were relocated from the Floydada to the Avard gateway through Enid by September 1973. GP38-2 677 at Enid, Oklahoma on December 23, 1980 (Gene Gant).